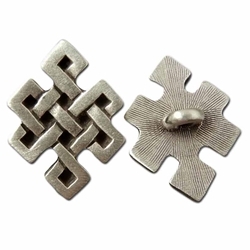 This Squared Celtic Knot Pewter Button is cast in the U.S. from lead free pewter and measures approximately 7/8 of an inch from top to bottom and 5/8 of an inch side to side. This button has a shank on the back for you to attach it to your garment. Perfect for any costume.